In 2015 a leading news article boldly claimed that “the future of electric vehicles is golf carts, not Tesla.” While that might sound like a headline from The Onion, it was actually published by none other than the Harvard Business Review. In the following years we’ve seen street legal golf carts skyrocket in popularity, and subgenres like lifted golf carts have taken off in ways nobody predicted. Except Guy Fieri. That means Johnny Law is paying more attention to marauding caddies than ever before. 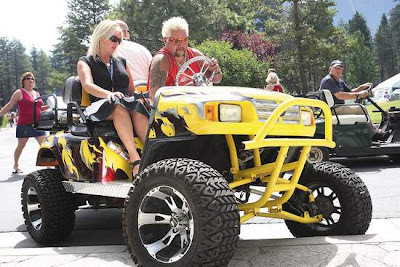 It’s generally illegal to drive a golf cart on public roads unless it has a license plate, and before you set about making your golf cart street legal it’s important to understand the legal definition of a golf cart and what distinguishes one from a Low Speed Vehicle (LSV). A Low Speed Vehicle is defined by law as a four-wheeled vehicle whose maximum speed falls between 20 and 25 miles per hour on a paved level surface. Its GWVR (total weight of all cargo, fluids, and passengers plus the vehicle itself) is limited to 3,000 pounds. Typical uses of LSVs include meter maids, campus security, grounds keeping, hunting, and yard work. Find them writing you a ticket even though you’ve only been parked in that loading zone for like 5 minutes sir, officer, I swear. The most common form of LSV is pictured below and resembles a street legal golf cart with an added dose of flavor. The low weight limit has promoted use of lightweight materials in the construction of LSVs, allowing them to carry up to six people plus luggage and still weigh under 3,000 pounds. This means Low Speed Vehicles get fantastic gas mileage that would make a small motorcycle look like a 1980’s Cadillac. Where are Low Speed Vehicles Legal to Drive? This handy map shows that 33 states currently limit Low Speed Vehicles to roads where the posted speed limit is 35 miles per hour or less. The Insurance Institute for Highway Safety reports that while LSVs are universally street legal by federal law, it’s up to each state to regulate LSV activity on its roads. · Don’t impede traffic: AR, WY. LSVs may drive on any road where they can achieve the maximum speed limit or do not significantly restrict the flow of traffic. · Local laws apply: AL, CT, MS, WI. Residents should check their city and county laws before operating LSVs on public roads. Notes: We included links for those states which differ from the IIHS map mentioned above. Many LSVs are safer than golf carts, but that’s not saying much. As NHTSA documentation explains, street legal LSVs aren’t required to meet the rigid safety standards that passenger cars must adhere to. If your neighbor’s Escalade T-bones an LSV at an intersection, it’s not hard to imagine that the outcome will most likely be in the SUV’s favor. Always drive on heightened alert when operating a Low Speed Vehicle on public roads. While you shouldn’t be texting and driving anyway, you definitely shouldn’t be doing it with no air bags and no crash protection to speak of. Driving a street legal LSV on public roads offers the same benefits as driving a golf cart: ease, convenience, efficiency, and an undeniable cool factor. Just look at those people, all hip and cool. What is a Golf Cart? Golf carts are defined by law as vehicles designed for use on a golf course and with a maximum speed of 20 miles per hour or less. Their price tends to be lower, and they often lack many of the fundamental safety features that make LSVs street legal in so many states. Where are Golf Carts Legal to Drive? Despite what the retirees at your local golf community might tell you, any street legal golf carts were most likely converted for street use by companies like Dirt Legal; it’s rare to find a street legal golf cart from the factory or at a dealership. Making a golf cart street legal is possible, but outside of retirement communities and college campuses, it’s generally illegal to drive an unconverted golf cart on public roads. Local laws may exist which make golf carts street legal during certain hours on certain roads. Even still, chances are those roads aren’t too far from a golf course. To be considered street legal, golf carts must meet the same registration, insurance, and inspection requirements as the other vehicles on the road. A license plate is generally required. How Safe are Golf Carts? LSVs (or perhaps UTVs) are generally what you’ve seen driving around rural towns or national parks, and even though they will sometimes resemble a golf cart, they’re substantially better built. If you get into a traffic accident in a golf cart, the results could be far more dramatic than your usual bumper tap. See above. Fun fact: motorcycle insurance often covers golf carts as well, but an LSV or Street Legal golf cart requires regular automobile insurance such as PDL and PIP. Why Drive a Golf Cart? We recently explained some of the many reasons why driving a golf cart is actually pretty great. Making a golf cart street legal is easier than you may think, so check out our guide on How to Make a Golf Cart Street Legal. Speed: Golf carts can travel up to 20 mph. LSVs can travel up to 25 mph. Safety: LSVs adhere to additional safety standards which golf carts do not. Price: Golf carts tend to be a few thousand dollars cheaper than LSVs. Legal Age: Often, neither LSVs nor golf carts require the driver to be of legal driving age or even possess a valid driver’s license. Check your local laws for more information. Legality: Most states allow street legal LSVs on some public roads. Street legal golf carts are allowed as well, but factory stock golf carts generally are not. Local areas may have their own rules in effect. Legality 2: Golf carts tend to lack the street legal parts found on LSVs (horn, windshield, lights, mirrors, and so on). You’ll need these parts to satisfy Johnny Law. Luckily, we sell them. We’re big fans of making strange things street legal, from ATVs to go karts. Golf carts can be made legal for road use in almost all 50 states, just make sure you’re not impeding the flow of traffic wherever you go. Check out our Conversions page to learn how we can make your LSV, UTV, or golf cart street legal for as little as $499.